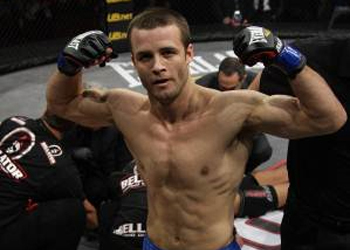 Pat Curran (Pictured) was pegged as a whopping 3.5-to-1 favorite to dethrone Bellator featherweight champ Joe Warren on Friday night. After pulverizing Warren in the 3rdRound for a knockout victory, we now know why. It was clear from the jump Curran would enjoy a significant striking advantage over his opponent. His assault was highlighted by a vicious knee to the face and a flurry of strikes that sent Warren to the canvas at the 1:25 mark. Curran has now rattled off four consecutive victories, three of which ended in devastating fashion. He earned his shot at the crown by taking last season’s 145-pound tournament. “Bellator 60” took place Friday inside Horseshoe Casino in Hammond, Indiana.